Several reviewers love the “old school vibe” of the Nike M2K Tekno sneaker. Some of the positive reviews focused on how the sneaker fits well with the growing demands of the ‘dad shoe’ market. Compared to other chunky-soled sneakers that “look outrageous,” one reviewer says its modern silhouette and narrower last makes the shoe stylish without going over the top. Many posted positive reviews about the sneaker’s comfort and cozy interior. A couple of commenters noted that in spite of the thick soles and massive silhouette of the sneaker the Phylon foam midsole remains lightweight. Multiple buyers said that they were satisfied with their purchase of the Nike M2K Tekno sneaker. A good number of users lauded the durability of the low-top footwear making it perfect for wearing all day. Nike M2K Tekno’s on-feet reviews showed the shoe as being a tad loose and spacious making it ideal for those with wide feet. Some purchasers are pleased with the color hits and pops and the many branding accents all over the shoe. They added that these make it trendy and fashion-forward for younger and style-conscious users. Buyers claimed that the Nike M2K Tekno men’s and women’s sneakers are affordable at $100 compared to similarly designed footwear of other brands. The edgier look of the sneaker drew rave on-feet reviews due to its supple leather material that does not easily crease and holds the sneaker altogether. Some wearers of the Nike M2K Tekno phantom, black, and pink colorway variations say the solid colors are easier to style and pull-off. One commenter complained of big shoe size issues and suggested that the “sneakers should be tried on before purchasing” for a perfect fit. The synthetic leather material on the upper could have been improved for extra durability, says one reviewer. The Nike M2K Tekno sneaker is heavily influenced by the Nike Air Monarch aesthetics. Receiving excellent reviews from most of its buyers, this low-top is a stylish, daily beater Nike kick built for comfort and durability. With numerous colorways, it comes complete with comfortable interiors and a surprisingly lightweight midsole. While some critics panned Nike’s use of cheaper materials such as synthetic leather in the Nike M2K Tekno’s upper, they do not discount that its $100 price is already a bang for every buck. The sneaker loving public had its first glimpse of the Nike M2K Tekno at the pre-Spring/Summer show of designer John Elliot in January 2018. The updated design is the brainchild of Nike Senior Footwear Designer Jin Hong. Hong, who was also part of the team that created versions of the Nike Air Force 1 and Air Jordan 1 in the 1 Reimagined, came up with an edgier version of the cult classic Nike Air Monarch. Nike designers fitted a narrower last into the silhouette for a better shape and a fresh dimension to the Monarch. As part of its contemporary makeover, the M2K Tekno men’s and women’s sneakers are also laden with new Swoosh logo executions while the comfort level is further improved through a thicker tongue that featured a NikeLab logo and a padded collar. The Nike M2K Tekno sneaker is the reworked version of the Nike Air Monarch. An iconic silhouette of the 2000s, the Air Monarch was a release of Nike Training which some 16 years ago took inspiration from fast food’s fries-and-soda combination where designers realized the importance of having a shoe that can act as an all-day and everyday shoe. To realize this inspiration, Nike designers had to study the American males in a theme park where they have learned the importance of having a comfortable and width-variable sneaker meant to be worn almost every day or as essential footwear. The result of their study showed that many of the target audience of the Air Monarch wanted a shoe with enough padding on the tongue and collar. Since its release in 2002, the Air Monarch has had a total of four iterations. The Air Monarch II in 2003 featured an improved internal construction, updating the sole by adding traction patterns. Designers of the Air Monarch II also added a pivot point in the outsole for rotation. The Nike Air Monarch III and Nike Air Monarch IV, meanwhile, were released some years later with improvements on the sole. Herringbone traction was added on the AM III while perforations were added to the Air Monarch IV with the recognizable chunky soles in sharp angles and aesthetic implements. Among those who popularized the Nike Air Monarch included Seattle Seahawks Coach Pete Carroll who was earlier seen wearing the shoe. Carroll was eventually given his personalized Air Monarch in a white/green colorway just in time for a Seahawks season game. Some 16 years, later, the fascination for the Air Monarch silhouette has continued with Nike releasing a fresher take to the profile through the Nike M2K Tekno sneaker. Surprisingly, however, the Nike M2K Tekno footwear was only initially designed primarily for women. Nike Senior Designer Hong says that despite the initial exclusive for women release, men also took a keen interest on the design. The unique for-women-design came out in May 2018 while the men’s sizes came out in August of the same year. Nike M2K Tekno women’s colorways also came out to be more than what is offered for men with hues such as Mahogany Mink, Particle Beige, Metallic Silver. 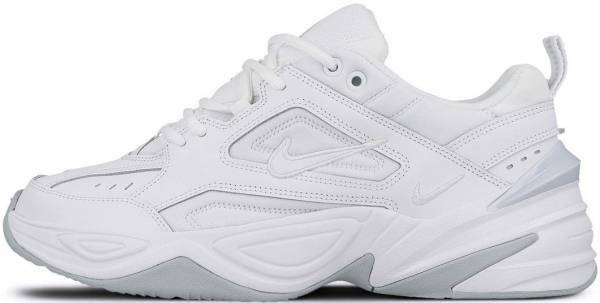 With the resurgence of chunky-soled sneakers or more popularly tagged as dad shoes in the market, the Nike M2K Tekno became a go-to dad sneaker option. For those who wanted to satiate their need for thick-soled kicks without breaking the bank, the Nike M2K Tekno became their alternative. Priced way below compared to expensive brands like Balenciaga, Gucci and Louis Vuitton, the Nike M2K Tekno is a cheaper dad shoe option. For just $100 per pair, the M2K Tekno also became a stylish dad shoe choice for those wanting a cheaper Nike version of the popular Adidas Yeezy 700 or 500. Thick-soled kicks like the Nike M2K Tekno sneakers are instant hype choices for the budget-conscious. Effortlessly blending with trendy streetwear, this low-top favorite is an instant cop for those wanting to ride on the hype of the dad shoe trend. The solid color blocking and brand detailing do not come as offensive and is not too bold compared to the use of extreme colors of other brands. With women’s sizes of the Nike M2K Tekno coming out first and followed by men’s sizes a few weeks since its release, the shoes were instantly a hit for the female audience that came out with six variants as compared to only four color choices for the men. Nike M2K Tekno women’s exclusive colorways feature fresh hues of Mahogany Mink, Particle Beige, Metallic Silver, Phantom, Atmosphere Grey, and Black. The Nike M2K Tekno men’s colors feature Dark Grey, White, Pure Platinum, and Black. To mix and match these chunky-soled kicks with clothes from mainstream streetwear labels is a stress-free endeavor. Just pair these with cuffed, tapered, cropped, or distressed jeans or chinos, and you’ll never feel out of the loop regarding styling for men and women. For women who want to experiment more on their outfits, the Nike M2K Tekno shoes is a brilliant chunky sneaker option to style with skinny jeans, tattered shorts, and even skirts for that chic and casual outfit ready for some #OOTD posting on social media apps. Padded interiors make the Nike M2K Tekno comfortable with its loose fit perfect even for those with wide feet configuration. While the sneaker generally runs true to size, some wearers suggest ordering them half size down for a snug fit while those wanting a loose and comfy feel may opt for its original relaxed fit. Putting these low-top shoes on and off is uncomplicated with a heel pull tab and regular round shoelaces for a secure upper. A thermoplastic polyurethane or TPU heel clip at the back of the Nike M2K Tekno sneaker also keeps the back part of the feet and heel in place. US sizes for these low-top sporty kicks range from 6-15 for men and 5-16.5 for women. With a fresh take on the Nike Air Monarch, the Nike M2K Tekno men’s and women’s sneakers add a new dimension to the favorite colorways to the dad shoe trend. The chunky sole is fitted from a narrower last while the upper is comprised of synthetic leather with a mix of textile for breathability. Also making the Nike M2K Tekno stand out are the new Swoosh accents. On its interior, the plush feel is a result of a thickly padded tongue and collar. While it lacks the comfort from the latest cushioning technology, the injected Phylon midsole delivers reliable support and a lightweight feel. The durable rubber sole like the Nike M2K Tekno comes with a tread pattern that has superb traction while the TPU heel clip keeps the heel in place. Stitched and printed Nike Swoosh branding details are found at the side panel, forefoot, bottom sole, and insole. NikeLab branding detail is seen on the tongue. A pull tab in contrasting color can be found at the back for fast slip on and off. Removable insole allows placing of orthopedic inserts. TPU heel clip at the back secures the back of the feet while giving support and stability. The durable rubber outsole has a non-marking feature and is inspired by the Nike Monarch IV. Celebrities spotted wearing the Nike M2K Tekno include Rita Ora, Emily Ratajkowski, Sofia Richie, ASAP Rocky, and Patrick Schwarzenegger. The women’s Nike M2K Tekno made its debut at the New York fashion show of John Elliot before the actual release in May 2018 and eventually men’s sizes in August 2018.